Democrats and Republicans in Congress salvaged an agreement on border security spending that depends on President Donald Trump accepting less than he’s been demanding for money to build a wall to avert another government shutdown. The tentative deal reached last night would provide $1.375 billion for 55 new miles of border fencing in the Rio Grande Valley area of Texas, according to congressional aides who spoke on condition of anonymity. That’s far short of the $5.7 billion Trump wants for a wall. But the agreement also rejects limits Democrats sought on detentions of immigrants apprehended in the U.S. When asked whether Trump will support the deal, Senate Appropriations Chairman Richard Shelby (R-Ala.) said, “We think so, we hope so.” He said the White House had given Republican negotiators wide latitude to reach a deal. The agreement on the remaining seven spending bills would keep government agencies open through the end of the fiscal year, including the Department of Homeland Security that oversees border protection. It was a rare feat of bipartisan compromise that only 24 hours earlier had seemed out of reach. But the drawn-out struggle is sure to be revived in the next budget battle and continue into the 2020 campaigns for the White House and Congress. Read more from Steven T. Dennis, Anna Edgerton and Erik Wasson. Trump walks off stage after speaking during a rally at the El Paso County Coliseum on Monday night. Detention Beds: Negotiations fell apart over the weekend around how many people can be detained by Immigration and Customs Enforcement. The deal by lawmakers may have bridged that impasse, but Anna Edgerton and Arit John break down the issue of detention beds and the role it played in the talks. Read the Bloomberg Quicktake. 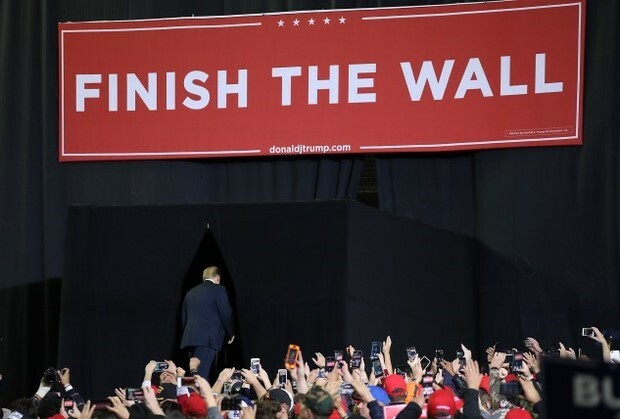 Dueling Rallies: Meanwhile, Trump and prospective Democratic challenger Beto O’Rourke took part in dueling rallies in Texas last night, with each using the president’s proposed border wall as an early proxy for the 2020 election. An estimated 10,000 to 15,000 people gathered at the event for O’Rourke, including iconic photographer Annie Leibovitz, who took pictures of O’Rourke before the gathering marched more than a mile to a venue within earshot of Trump’s rally. Read more from Justin Sink and Jennifer Epstein. Iowa Floats ‘Virtual’ 2020 Caucus: Democratic leaders in Iowa yesterday proposed a major change in the state’s presidential caucuses by allowing a form of absentee voting next year that aims to expand participation in the first 2020 nominating contest. It would let Iowa Democrats take part via telephone or online in one of six “virtual caucuses” during the week before the traditional Iowa caucuses. That would allow people to get involved even if they can’t attend the traditional gatherings in person because of a disability, work, parenting or another reason. The proposal, which still needs to be approved by a central party committee in Iowa and the Democratic National Committee, calls for the virtual meetings to generate roughly 10 percent of the delegates that will be awarded from each of the state’s four congressional districts. That could mean that virtual participation will carry less voting weight than in-person participation. Read more from John McCormick. Received the newsletter from a colleague? Trump, Cuomo to Meet on SALT: Trump and New York Gov. Andrew Cuomo (D) will meet today to discuss a change in the 2017 tax law that limits how much a taxpayer can deduct for state and local taxes from IRS bills, according to a statement from the governor’s office. Democrats and some Republicans in high-tax states like New York and California have been pushing to repeal the $10,000 cap on deductions for state and local taxes, a tax break that was unlimited until the 2017 tax-code overhaul. Read more from Laura Davison. NATO Influence: The U.S will fight to regain influence in NATO’s eastern flank, particularly in countries such as Hungary where the government’s spotty record on democracy led to a freeze in relations that allowed Russia and China to extend their sway, Secretary of State Michael Pompeo said. Pompeo, in the first visit to Hungary by a U.S. secretary of state since 2011, warned yesterday against the dangers of drifting into Russia’s orbit and called on Hungary to prevent China from creating a “bridgehead” that could leave Budapest indebted “economically and politically.” He said the U.S. would fight for “positive influence” across Eastern Europe. Read more from Zoltan Simon. Pompeo also came close to issuing an us-or-them ultimatum to nations buying from Huawei, saying in Hungary that contracts with the Chinese networking giant could limit the availability of U.S. equipment. “If that equipment is co-located where we have important American systems, it makes it more difficult for us to partner alongside them,” Pompeo told reporters, when asked what message he would send about Huawei. “We want to make sure we identify the opportunities and the risks with using that equipment. And then they will get to make their decisions.” Read more from Nick Wadhams and Zoltan Simon. Venezuela: Trump likes to boast about his disruptive foreign policy style — calling North Korea’s leader “Little Rocket Man” or announcing plans to pull troops from Syria without notifying his top generals. But with Venezuela, Trump is playing it uncharacteristically straight, using textbook diplomacy that he usually shuns in seeking the ouster of President Nicolas Maduro. Instead of going it alone, Trump has leaned on a patient mix of sanctions, behind-the-scenes diplomacy and a ratcheting up of public pressure that has bolstered — for now — National Assembly leader Juan Guaido’s claim to the presidency. That’s helped lure more than 30 nations to Guaido’s side, making it harder for Maduro to call it all one big “Yankee” plot to overthrow his regime. Read more from David Wainer. Trump-Xi Meeting: The Trump administration said the U.S. president still wants to meet China’s Xi Jinping in an effort to end the trade war, a sign of optimism as negotiators from the world’s two-biggest economies start their latest round of talks this week. “He wants to meet with President Xi very soon,” White House adviser Kellyanne Conway said yesterday on Fox News. “This president wants a deal. He wants it to be fair to Americans and American workers and American interests.” Uncertainty whether the leaders will meet to finalize an agreement has stoked concerns that negotiations are faltering as the March 1 deadline approaches. Read more from Andrew Mayeda and Miao Han. Artificial Intelligence: Trump signed an executive order yesterday directing the U.S. government to prioritize artificial intelligence in its research and development spending, the White House said. The order, which comes amid concerns about China’s ambitions to dominate the sector and the likelihood of disruption for workers as the technology automates millions of jobs, doesn’t outline specific funding goals, but says it aims to ensure that AI develops in a manner that reflects U.S. values and to push training for the future workforce. Read more from Ben Brody. Coal Power Plant: Trump is lobbying a federally owned entity to keep a Kentucky coal-fired power plant operating. The Tennessee Valley Authority “should give serious consideration to all factors before voting to close viable power plants, like Paradise #3 in Kentucky!” Trump said in a tweet yesterday. Trump has been very vocal about wanting to keep coal plants operating and the governor has also weighed in on the fate of the Paradise plant. But even though the TVA is a federal government agency rather than an investor-owned utility, their ability to sway the board may be limited. Read more from Will Wade. Protecting Dreamers: More than 100 CEOs of companies, trade and civil society groups sent a letter to congressional leaders yesterday calling for legislation to protect the legal status of individuals who were brought to the U.S. illegally as children, called Dreamers, Michaela Ross reports. The letter laid out the economic contributions of Dreamers, who were given protections under the Obama administration’s Deferred Action for Childhood Arrivals program. Courts have upheld those protections temporarily after President Trump rescinded the program in 2017. The letter’s signees say now is the time to for Congress to pass permanent legislation as border security negotiations to avert another government shutdown continue this week. Teacher Groups Push Gun-Control: Two teachers’ unions and a national group supporting gun control are urging passage of tougher background checks and temporary removal of guns from anyone showing violent behavior as steps to avoid school shootings. The groups, in a report released yesterday, warn against arming teachers, saying full-time instructors lack the training necessary to handle an active shooter and could make a school shooting even more dangerous. Read more from Emily Wilkins. New OSHA Chief of Staff: Attorney Krisann Pearce has been named the Occupational Safety and Health Administration’s chief of staff, the agency said yesterday. Before joining OSHA, Pearce was general counsel at the House Committee on Education and the Workforce for almost eight years, serving while the Republican Party controlled the House, according to her LinkedIn resume, Bruce Rolfsen reports.